Gould's version of Bach's Goldberg Variations. because he was playing with his TOES. For many years afterward I believed this to be true. I felt especially lucky to know the only man in the world who could play the piano with his toes. 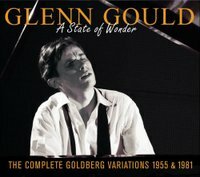 As the years passed, the Goldberg Variations were my special connection with my Dad. In fact, I didn't like to share my listening experience with anybody else except my Dad. It just didn't feel the same. When I would play the piece without him, I would plug my self in to earphones so it was all encompassing. circle of life for my DAD and me.